Freising is located approx. 35 kilometers north of Munich on the river Isar with a population of approx. 45,800. 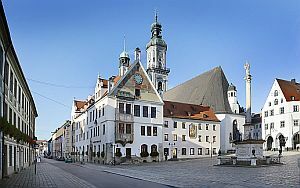 Freising is renowned for its ancient history, the bishop’s cathedral on Cathedral Hill (Domberg) and the oldest working brewery of the world on Weihenstephan Hill. 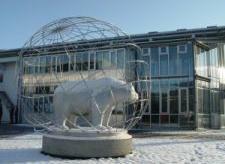 This is where the TUM School of Life Sciences Weihenstephan is situated. The Mayor of the City of Freising attaches great importance to a good relationship with the university. He makes a point of welcoming freshmen students in a separate event in Freising every year and awards a unique prize in the amount of 20.000 € every two years for an outstanding scientific project carried out in international or national cooperation. In the year 724, Korbinian first came to Freising on his way to Rome. He was going on foot with a mule carrying his belongings when a wild and hungry bear attacked his pack animal. As punishment, Korbinian made the bear carry his baggage to the Eternal City. At the invitation of the Duke of Bavaria, this resolute and holy man later came to Freising where he miraculously brought a spring to life on the side of the Weihenstephan hill. Korbinian is considered the first bishop of Freising and founder of the archdiocese of Munich and Freising. The bear carrying Korbinian’s luggage is today incorporated in Freising’s coat-of-arms, and Weihenstephan is a campus that unites traditional and modern elements in a unique way. The location is a closed campus on the outskirts of the town of Freising, which means that all lectures and seminars can normally be reached within a few minutes on foot. Three bus stops provide connections to the public transport system, which takes you to the town center in about five minutes. The designation “Green Center” is related not only to the numerous course-offers, but also to the campus itself. Located in a charming landscape of a tertiary hill region, there is a mix of historic buildings combined with modern architectural features surrounded by well-kept park areas, which are connected through a network of tree-lined footpaths. Together with large lawns where summer festivals and special outdoor events are held, there are also four historic gardens for students to visit. A refectory and two cafeterias offer a variety of meals, including vegetarian dishes, at low prices: starting at around one Euro for a hot main meal. The Unibar is a popular meeting place, which has a selection of beverages and offers a different hot meal daily. There’s also an Asian food takeaway, and a Segafredo Coffee Bar rounds off the choice. The Weihenstephan campus isn’t only home to the TUM (Technische Universität München) but also to other research institutes: the University of Applied Sciences Weihenstephan-Triesdorf, the Bavarian State Research Center for Agriculture, the Bavarian State Research Center for Forestry, Germany's National Meteorological Service - Agri-Weather, the Fraunhofer Institute for Process Engineering and Packaging and the Bavarian State Brewery Weihenstephan. Almost a thousand years ago the Bavarian State Brewery Weihenstephan was the monastery brewery of the Benedictine monks. It is nowadays operating as a state directed enterprise under the control of the Bavarian Government. As the oldest still existing brewery in the world it stands upon the Weihenstephan hill, surrounded by the comparatively very young School of Life Sciences of the Technical University of Munich. The former monastery building is nowadays home to the Administration Division of the School of Life Sciences Weihenstephan (WZW). It has a beautiful baroque hall on the first floor, called Asam-Hall which used to be the guest dining hall of the monastery and is named after the famous painter-family that also ornamented the Freising Cathedral. The most convenient way of getting around Freising is by bicycle! Some bike shops in Freising have good offers on second-hand bikes. Base rate of Semester Ticket – included in tuition fee- valid every night from 6 p.m. till 6 a.m. plus weekends and public holidays. 31 March 2018 (valid 24 hours– only in combination with Semester Ticket and passport). The semester ticket is valid for second class travel within the entire MVV network, on all forms of MVV transport (S trains, U trains, trams, busses and certain regional trains). There are about 3 train connections per hour; travel time on regional trains is approx. 25 minutes, 45 minutes on the S-Bahn/Suburban Train. The semester ticket is valid on both DB-regional trains and MVV Suburban Train and needs to be carried with you at all times. The best connection to go to Technische Universität Main Campus in Arcisstrasse 21 is to take Bus # 100 from the Central Railway Station Munich to Arnulfstrasse (3rd stop is Technische Universität) . The “Münchner Verkehrsgesellschaft” (MVG for short) offers monthly, weekly, daily or single-ride tickets to suit your individual needs. Munich and its environs is a dream-come-true for sports enthusiasts. There is the Alps and the Bavarian lakes but also the Olympic Park built for the 1972 Games and now home to the University Sports Center. For those of you who do not get enough exercise riding your bicycles to and from the Campus, Hochschulsport (University Sports Center) offers an exciting range of sporting opportunities for you in Freising-Weihenstephan as well as Munich. www.zhs-muenchen.de/en/home/ for a list of offers and courses and the Sports Department in Alte Akademie 1, Weihenstephan for further details (cost of basic stamp 7.50€/term). There is a gym and a beach volley ball pitch on the Weihenstephan Campus. There is also a varied program of fitness courses like pilates, aerobics, yoga, zumba etc. and other sports on offer. Check the website for details. In winter: Freising has a newly-built ice-skating rink. The 15th of October is also the start of the skiing and snowboarding session of the Freising Skiing-School. They offer courses or day-trips to various skiing areas. Finding accommodation in the Munich area isn’t easy. In Munich, Freising (and Rosenheim), the student union STUDENTENWERK offers affordable rooms and apartments for students; the rental costs in Freising are around €260 per month depending on the type of room but the high demand for such rooms produces waiting times between one and four semesters, depending on the halls of residence and locations. For students participating in an exchange program it is NOT possible to take part in the online registration at Studentenwerk. In response to the universities’ internationalization efforts, the Munich Student Union is, however, offering a Servicepaket (service package) for students who participate in an international exchange program. In Freising-Weihenstephan,the Campus Office has a limited number of Servicepaket-rooms available which are allocated to applicants by means of a raffle. When you’ve been nominated and accepted as an Erasmus or TUMexchange student in our School of Life Sciences, you will receive an Email asking whether or not you wish to apply for one of the Servicepaket-rooms in Freising. You should then answer within the given deadline! If you are staying in a dormitory, please check when your tenancy agreement starts. If you wish to arrive before the tenancy agreement starts, you will need to arrange alternative accommodation. Please keep in mind the opening hours! Monday thru Friday 9 a.m. - 12.00, Wednesday 1.30 p.m. thru 3.30 p.m.
and plan your arrival accordingly. Rooms in student residence halls are in high demand. You should apply as soon as you receive your notification of admission. The applications are processed by the Studentenwerk (Munich Student Union), which runs the residence halls and allocates rooms. To read the local newspaper adverts and look at the postings on the bulletin board at the university is the most efficient way of searching a private room. If you can arrange it, come to Freising for a short time before the semester starts and make an intensive query. 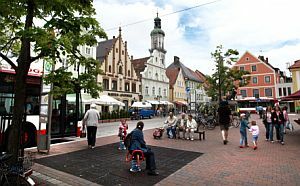 For contacts to people in Munich who might be in a similar situation and may have valuable recommendations in certain cases, please have a look at toytown Munich. Note: In Germany, the monthly rent usually consists of two components: the basic or cold rent (Kaltmiete, i.e. excluding service charges) and the ancillary rental costs (Nebenkosten, i.e. water, refuse collection, municipal fees, etc.). The basic rent plus ancillary rental costs make up the so-called warm rent (Warmmiete). On top of this, the tenant must also pay the monthly electricity, gas and telecommunication bills, which she/he usually remits directly to the supplier and not to the landlord. Many landlords have integrated the cost of heating in the ancillary rental costs for furnished rooms. Accommodations are always let for a full month. Customarily, the tenant pays for the entire month, even if she/he arrives later or leaves earlier. All the best with your search! As you are coming to Munich from abroad, there are a number of legal requirements you must comply with. Please review this overview (pdf, 527 KB) to get all the information you will need concerning immigration requirements (Who will need a visa to enter Germany? ), residence permits (Who must apply for one? ), police registration (How does it work? ), health insurance (for enrollment at TUM), deregistration from the register of residents, working in Munich, etc. Living expenses in Germany are slightly above average in a European context. They are below those of countries such as Denmark, Luxembourg or Switzerland, but are quite high compared to countries such as Asia, Africa or Latin America. Doctors have different opening times and are generally closed on Wednesday afternoons. It is advisable to make an appointment by telephone. In urgent cases you can see a doctor during consultation hours, but there may be long waiting times. In the case of a non-life threatening emergency, you should contact a doctor on emergency duty (Tel. 116 117). For life-threatening emergencies please call 112. Medication is often only available on a doctor’s prescription at the pharmacy. The health insurance scheme generally pays for such medication, but you will have to pay an additional pharmacy charge between 5 and 10 Euros yourself. Pharmacies are mostly open Monday to Friday from 8.30 a.m. to 6.00 p.m.and on Saturday morning. Outside these opening times you will have to look for a pharmacy on emergency duty. Details of which pharmacy is open ‘Apotheken-Notdienst’ can be found on the internet. During the week from Monday to Friday, most shops in the big cities are open between 10 a.m and 8 p.m. Supermarkets open between 7 and 8 a.m. Most shops in Freising close around lunchtime on Saturday. At night and at the weekends, a selection of bakery products, food, newspapers and other articles are available at gas stations. Some shops and food stores at the airport and in the main railway stations are also open on Sundays and public holidays. In Germany, a deposit (Pfand) of between 8 and 25 cents is charged for most beverages sold in bottles and cans. When purchasing beverages in returnable bottles you therefore also pay a small additional charge, which is reimbursed when you return the empty containers to the shop. Depending on the type of bottle, empty bottles can also be returned to the supermarket and fed into a machine which adds up the refundable amount you will receive at the checkout. A deposit is also charged for bottles which you buy in our canteen or the cafeteria. Smoking is forbidden in all public buildings, railway stations, airports, on public transport, in pubs and restaurants. Germany has a selective system of waste disposal. Every household in general has 3 bins: a black for domestic waste like leftover food, dirt, nappies etc., a brown for organic waste, a blue for paper waste. Packaging which bears the “Green Dot” symbol and recyclable waste such as plastic or aluminum - yellow sack or bin. For glass there are special containers in public areas. Dead batteries go into special disposal containers in supermarkets and cork can be handed in at the local refuse center.